The letter may be found here.“This letter sends a powerful message to the Senate that Brett Kavanaugh does not have the confidence of hundreds of top legal experts in the United States,” said Nan Aron, President of Alliance for Justice. “We believe this is a moment for Senators to ask themselves why this nominee engenders so much concern. Brett Kavanaugh is polarizing precisely because his entire career suggests that he would subordinate concern for the law and the Constitution to a partisan political agenda. 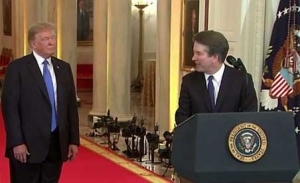 We urge Senators to consider the issues raised in this letter before casting a vote on Kavanaugh’s confirmation.”Leading legal scholars who have signed on to the letter include Erwin Chemerinsky, Peter Shane, Herman Schwartz, Abbe Smith, Michael Wishnie, Issa Kohler-Hausmann, David Singh Grewal, Bruce Ackerman, Jedediah Purdy, Susan Rose-Ackerman, and Amy Kapczynski. The letter describes several key areas in which Kavanaugh’s record is troubling, including: his embrace of a “backward-looking” view of the Constitution that emphasizes literal reading of the historical text as a pretext for advancing a conservative agenda; writings that suggest he would shelter the President from the rule of law; rulings that suggest he would undermine access to affordable health care; evidence that he would gut women’s constitutional rights affirmed in Roe v. Wade; rulings that demonstrate his hostility to environmental protection; his opposition to the authority of government agencies to enforce laws to protect the public; and his overall propensity to side with powerful corporate interests over workers, consumers, and the rights of all. AFJ’s report on Kavanaugh’s record may be found here.